Kodak has begun shipping its new Ektachrome E100 slide film to retailers. The announcement has come ahead of the Photokina photography trade show in Cologne, Germany, which begins on Wednesday (26 September). In August Kodak started sending out beta rolls of the film to selected photographers to test. The film was originally announced at the CES trade show in the US in January 2017. 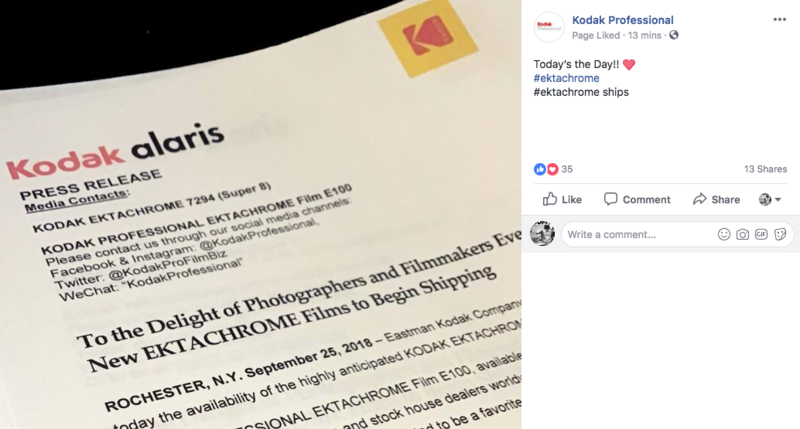 According to Kodak Professional, who shared the news via their Facebook and Instagram accounts, the 35mm format film began shipping on 25 September. 8mm cine film is due to ship 1 October, while 16mm cine film is expected to be available by the end of the year, reported EMULSIVE. Ektachrome E100 marks the return of the famous Ektachrome marque to Kodak’s roster after the last remaining versions of the film – including E100G and E100VS – were canned in 2011. It was the last remaining slide emulsion produced by Kodak, following the discontinuation of its famous Kodachrome slide back in 2009.